Primitive Skills » Skinning small animals. Zygethian Forum » Science and Research » Resources » Primitive Skills » Skinning small animals. In this case I'll use a Rabbit as a example. First you start by cutting a ring around the paw of each leg of the Rabbit, not too deep just enough to get through the Hide, then do single slice from up the ring cut of each leg on the back of the Rabbit. 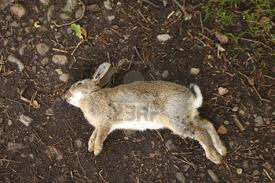 Then start pulling the Hide off the animal, Cutting the Animals tail off, work your way from the legs to half-way up the body, then cut the Rabbits head off, with it you should be able to peel the fur off like a Banana. To keep the Fur, simply Stick it on a Drying/Tanning racks and scrape the flesh off the back of the Hide. Then you wash and dry it and now it's ready for Use. An easier way of skinning is Case skinning, this however is usually used for smaller animals. Animals should be skinned within two days of being caught. Animals are typically hung by the hind limbs and the skin around the circumference of the ankles. A cut is then made from the leg to the tail. Cuts are shallow so that fat is not dislodged, which could get into the fur. Cutting continues to the front legs. Cuts are made around the lower joints of the forelimbs so that the legs can be pulled through. Cutting continues until the ears are reached. Cuts are made through the ears and then the eyes and finally the skin is cut off the nose. The skin with fur can then be slipped off the body like a sleeve. Once the pelt is removed from the carcass of a small animal, it is then pulled over a board. All fat is scraped from the inner surface of the hide. The pelt is then pulled over a simple A-shaped frame made of wood or wire, called a "fur stretcher", "pelt stretcher", or simply "stretcher". The pelt and stretcher are then hung up to dry in a cool, dry place. After about two weeks, the pelt is ready to be used. What would also be a smart idea is to set up a so called fur-farm, in which we keep small animals like rabbits, minks and foxes for their fur and meat. I was thinking of the domesticated animals, I was thinking of Rabbits, Wolves, sheep and wild Boar (Pigs) at first if resources allow.